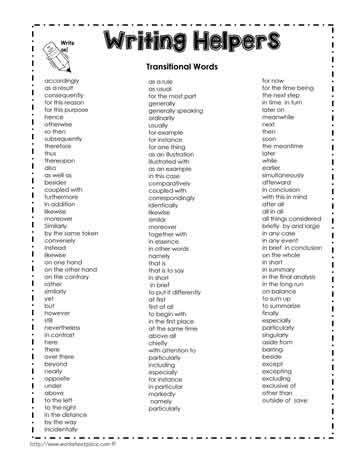 A printable list of transitional words and phrases. Free printable for transitional words. Students often need reminders about the many transitional words available to help them become better writers. The flow of their writing improves with the appropriate use of transitional words. Learners develop a better flow to their writing and these words help with organization of their thoughts. The use of transitional words should be modeled first and learners should be provided with some lists to help them find the right words to connect their thoughts and ideas more readily. Their writing will naturally improve as they begin to connect the relationships in their thoughts and ideas. Print this list for students to keep in their writing folders. Enlarge the list and post on the wall for easy access. Provide exercises for learners to use the words. For instance, give samples where they are required to use a transitional word or phrase.